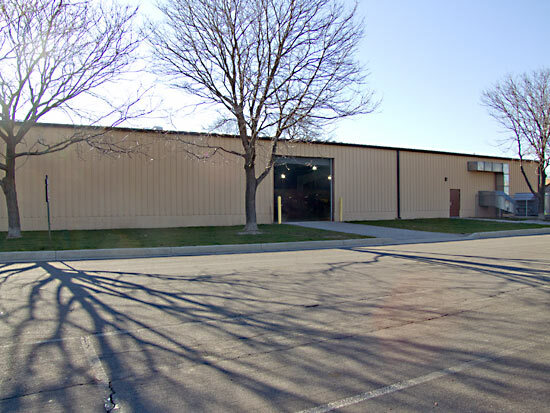 Location: Kalamazoo County Fairgrounds, Kalamazoo, Michigan 49048, USA. 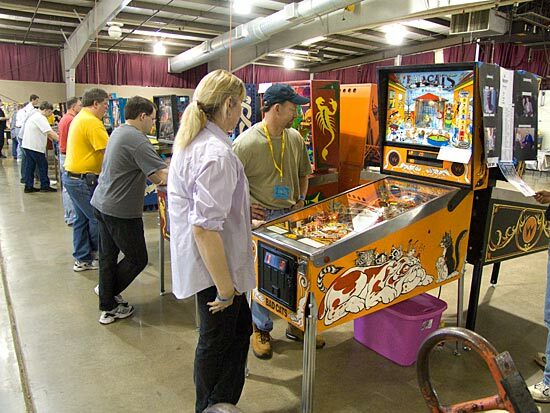 This was the 10th annual Pinball at the Zoo show and although visitors will have realised this, for those who have never been, the show is not held in a zoo. The zoo in the title coming from the contracted name of the show's location of Kalamazoo in Michigan. In fact there is no zoo of the animal variety in Kalamazoo and if anyone tells you otherwise, they're lion. So we we're in Kalamazoo at the Country Fairgrounds on a warm, sunny Friday and Saturday in the middle of April. 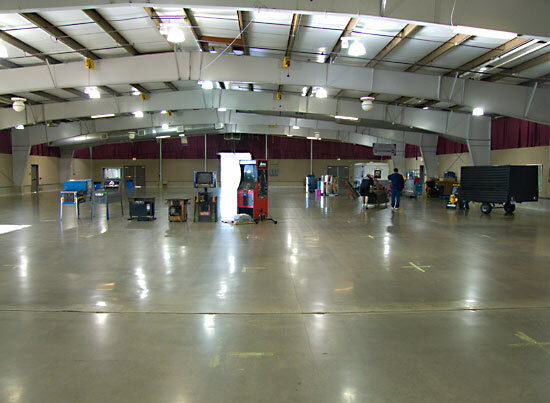 Before the show opened at 1pm on Friday though, the assorted vendors, exhibitors and machine suppliers needed to set up their respective areas in the hall. For the first time in the show's ten years, the organiser Kevin Ketchum was allowed access on Thursday evening to unload some of the show's infrastructure which helped speed things up the following morning. 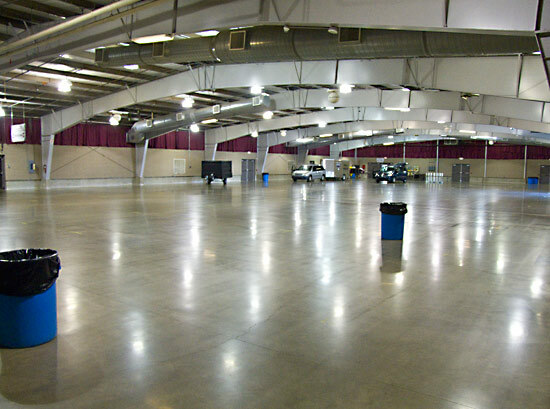 The hall opened to vendors and exhibitors at 8am on Friday and gradually the large empty space started to fill. 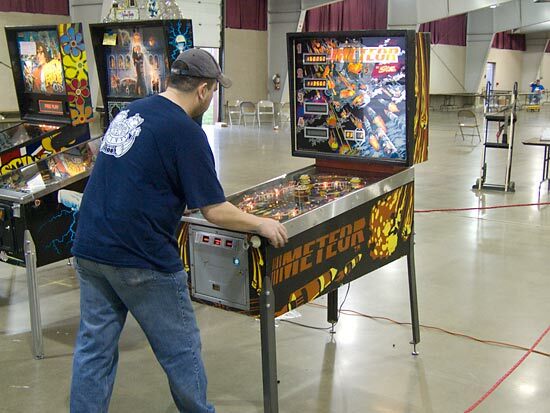 The doors opened to the public at 1pm and although more games were still being brought in, there were plenty of pinball and video machines ready to play. Entrance to the show cost $10 per day for adults, $5 for kids and along with the entry, all visitors were entered into a draw for a large number of door prizes. 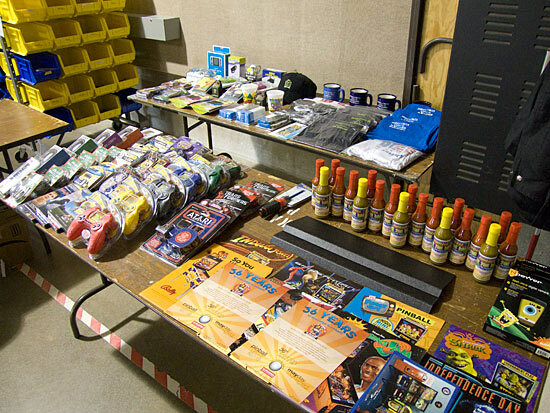 These included cell phone chargers, Brain Bogglers, LED flashlights, mini video games, DVDs, flyers, Glare Guards, bottles of custom labeled hot sauce, mini digital cameras, mini strobe lights, AC adaptors, PAPA hats, Pinball Circus mugs and t-shirts and multi-way screwdrivers. For those who wanted a guaranteed memento of the show, t-shirts were on sale for $10 ($12 for sizes 2X and above). They proved very popular and the most common sizes quickly sold out leaving a few visitors wishing they had pre-ordered and reserved theirs. 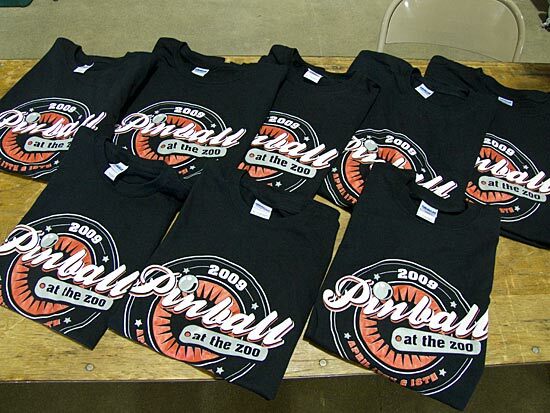 Several people commented how they thought it was the best design yet for Pinball At The Zoo t-shirts and the rapid sales would support that. 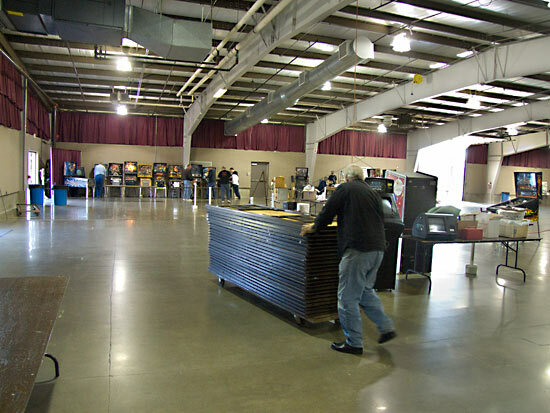 The free play machines were mostly arranged in the centre part of the hall with vendors positioned around the edge and the tournament area near the entrance. The games were a mix of video and pinball. There were 69 pinballs, 44 videos and 1 novelty game set up and available for public play. 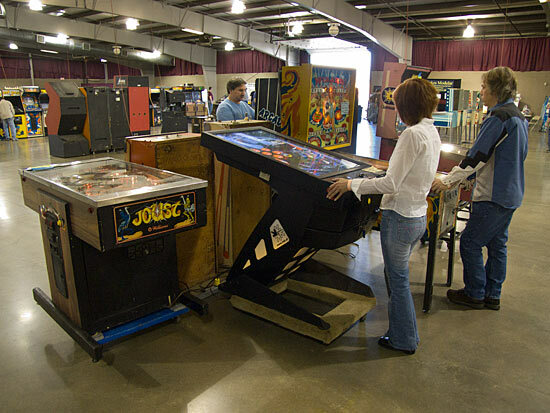 As the show progressed, some games arrived and a few were sold and taken away so not all these machines were necessarily available at the same time. 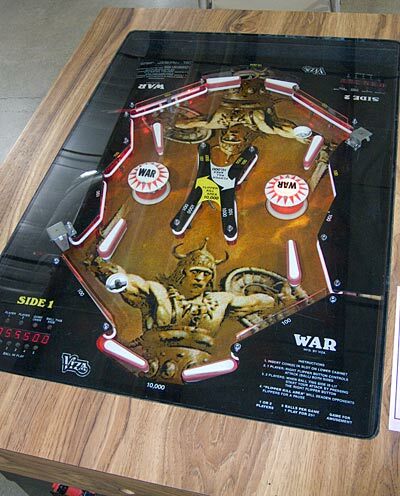 One of the most unusual games on display was this War head-to-head cocktail model from a company called Viza. Many of the games were for sale with prices generally at the more realistic end of the scale. There was a good turnout of vendors, selling parts old and new, complete games, incomplete games and numerous accessories. 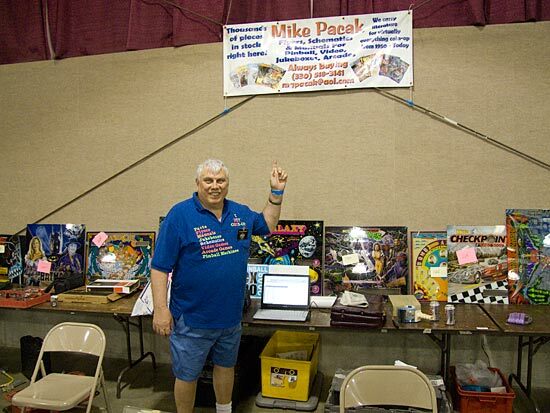 Mike Pacak was there with Lonnie Mihin. 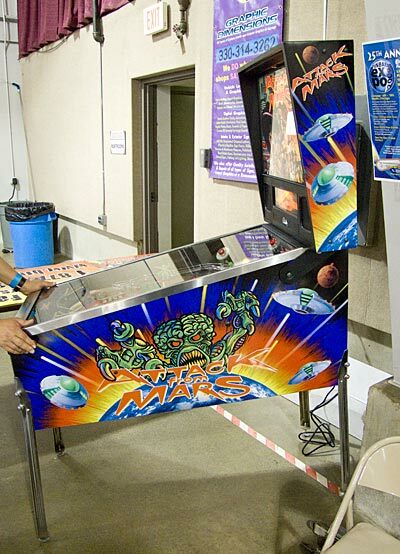 Mike had his vast collection of flyers, manuals, backglasses and translites while Lonnie was exhibiting his custom artworked Attack From Mars which he intends to develop further and show at Pinball Expo in October. 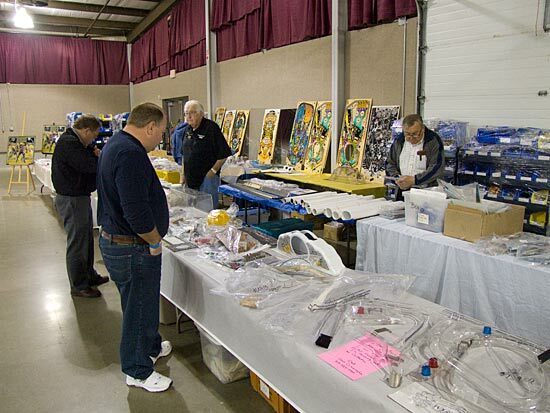 Gene Cunningham was there with his large Illinois Pinball stand of NOS and reproduction parts. Two locals also had extensive parts stands. Both John Dayhuff and Eric Avedesian had a wide range of plastics, playfields and assorted spares. 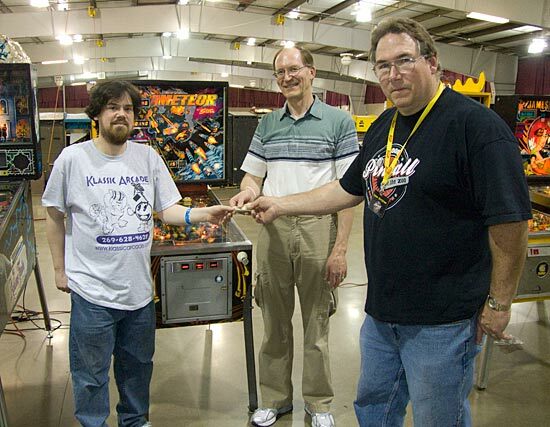 Sharing Eric's stand were Chuck and Don from Nucore who were showing their replacement Pinball 2000 computer system running Revenge From Mars and Star Wars Episode 1. Show organiser Kevin Ketchum also run's K&K Amusements and he had numerous racks of new pinball parts which sold continuously throughout the show from his stand near the entrance. 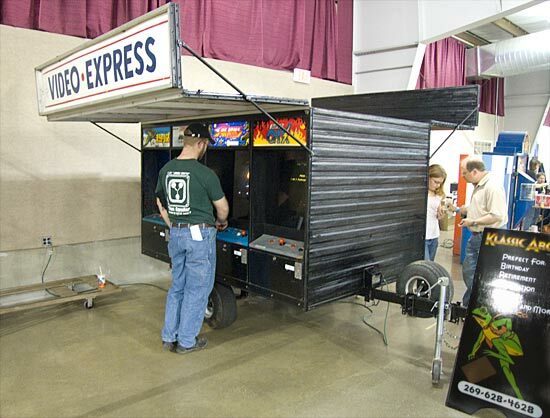 ...while next to them was a trailer fitted with eight video games, called the Klassic Arcade To Go. 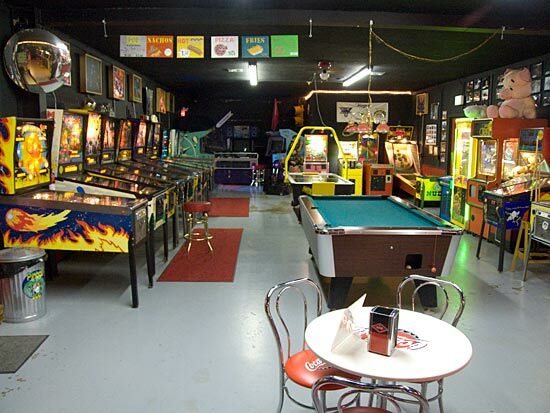 What links the video games, the soda pops and K&K Amusements is the Klassic Arcade in nearby Gobles which is co-run by Kevin and is where you can find these classic videos, pinballs and over 100 different sodas. The first of the show's four tournaments took place on Friday evening in the roped-off tournament area. 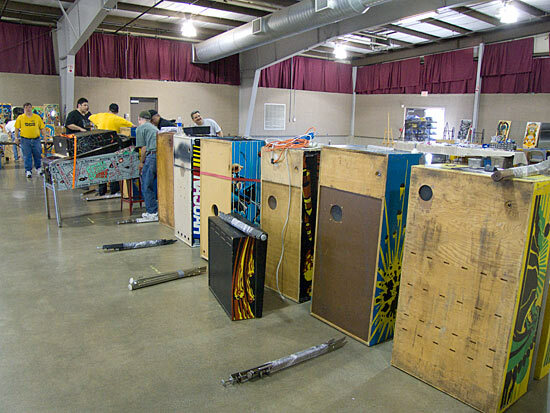 Eight machines were used for the various competitions - Theatre Of Magic, Austin Powers, The Addams Family, Meteor, Rocky, James Bond, No Fear and Ripley's Believe It Or Not. 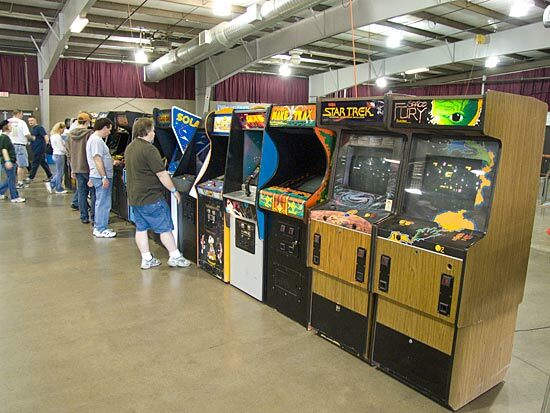 The first four were used in the Open tournament, Rocky and James Bond were the Classics machines while No Fear and Ripley's were the Youth games. But it was a different competition which took reached its conclusion on Friday evening. The Draw Your Partner tournament randomly paired players who took one flipper button each to play another pair in a single elimination best-of-three-games format. 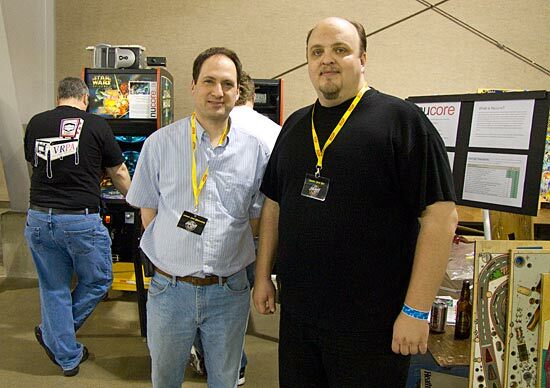 18 players took part at $5 each, creating nine teams of two. An initial play-off knocked out one team and the remaining eight teams were reduced to four and then to two for the final. In that final, it was Bob Matthews and Fred Ochs who were triumphant over Jeff and Martin, taking the prize pot of $90 to split between them. Saturday was, as expected, the busiest day of the show. A few additional games arrived to replace those sold the previous day and qualifying for the tournaments continued. There was a small auction of six games on Saturday lunchtime. These were positioned in a roped-off area at the back of the hall but due to a lunchtime commitment, we don't have the results for those machines. The three remaining tournaments were the Open, the Classic and the Youth. As with the Draw Your Partner event the previous day, the tournaments were run by Andy Rosa, Aaron Page and Joe & Melissa Housemen. The 12 players in the Youth Tournament was the first to finish. The first semi final was between Andrew Rosa and Paul Inman while Joshua Henderson and Ahna Rosa contested the second semi final. Andrew beat Paul and Joshua beat Ahna to reach the final. In a closely fought final, it was Andrew Rosa who came out on top collecting the $35 top prize, leaving Joshua Henderson in second place with $24, Paul Inman in third with $11 and Ahna Rosa in fourth. The penultimate tournament was the Classic and the 19 competitors played on James Bond and Rocky. Entry cost $2 per game and the money was evenly split between prize pot and the American Cancer Society. The top qualifier when qualification closed at 3pm was Bob Matthews and in the best-two-of-three playoffs, he got to choose the machine and the play order. In other matches, the higher qualifier got to choose either the game or the play order with the lower qualifier choosing the remaining option. The other qualifiers in order of qualifying position were Zach Sharpe, Jeff Josefosky, Andy Rosa, Jason Magnuson, Josh Sharpe, John Miller and Trent Augenstein. The quarter finals were between Trent, Jason, Josh and John which resulted in Jason Magnuson and John Miller going through to the final. It was another exciting final and the winner was John Miller who picked up 50% of the entry fees and 3 entries to the PAPA classic tournament. 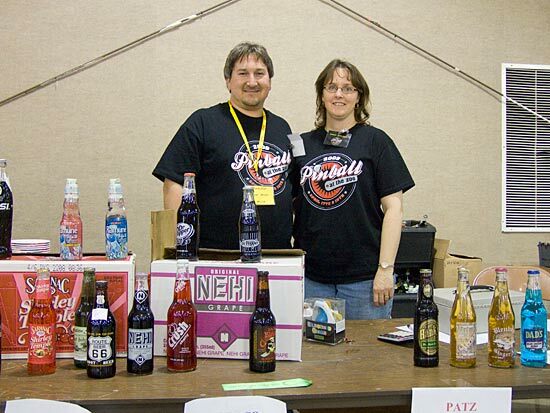 Josh, in second place, collected 2 PAPA classic entries. The final tournament was the Open which cost £4 per game (or three games for $10) and was played on Theatre Of Magic, Austin Powers, The Addams Family and Meteor. 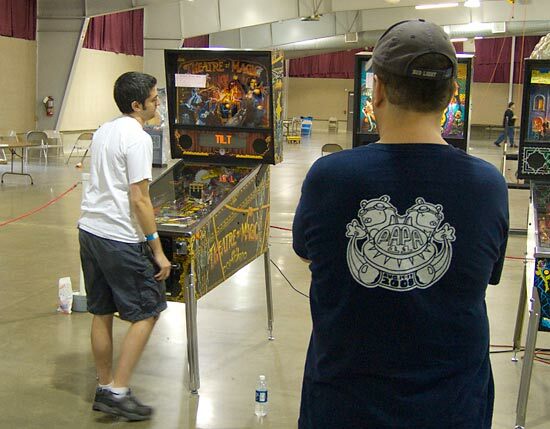 A player could just about qualify if they got the top score on three of the machines but in practice they would need to play all four for a cost of at least $14. As with all the tournaments, players could buy as many entries as they wished. 32 players took part and they averaged around 9 entries each. The top 12 players qualified for the play-offs with the best 4 gaining a bye through the first round. Those four were Andy Rosa, Bob Matthews, Trent Augenstein and John Miller. The remaining eight qualifiers were Martin Ayub, Zach Sharpe, Josh Sharpe, Bob Skinner, James Edes, Mark Salas, Aaron Page and Aaron Cooke. The first round of play-offs between qualifiers 5-12 was single elimination which reduced the eight players to four. Bob Skinner, Aaron Cooke, Aaron Page and Mark Salas went out at this stage. The second round brought back the top four qualifiers and the format changed to double elimination. In these matches, Andy beat James, Martin beat John, Zach beat Trent and Josh beat Bob. The losers went into the loser bracket for a second chance while the four winners played each other in the third round. In that third round of the main bracket, Andy beat Martin and Josh beat Zach, the losers again going into the loser bracket where Trent beat Bob and John beat James to put them out of the tournament. Andy played Josh to see which of them went straight into the final with Josh triumphing. 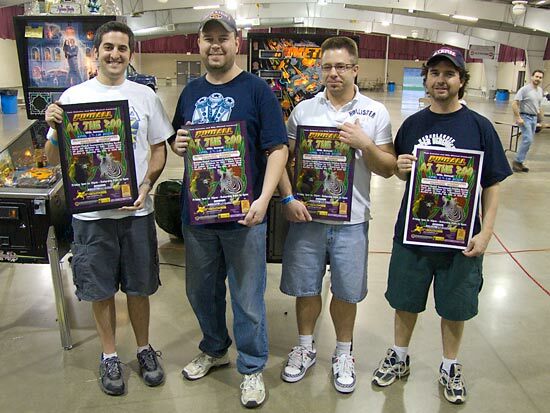 He met John in the final after John beat first Trent and then Andy in the loser bracket. John's comeback was completed when he beat Josh in the first two games of the final to put them on equal terms going into the final best-of-three games. John's comeback was cut short though, as Josh beat him on The Addams Family to take a 1-0 lead. The second game was on Meteor and it produced an unusual problem. When John played his first ball he tilted it and also appeared to tilt Josh's first ball at the same time, which under tournament rules would have handed the game to Josh. However Meteor being a Stern game, when Josh's "tilted" ball was plunged and allowed to drain, the game continued allowing Josh to play his first ball as normal, so the final could continue. Despite being given this reprieve, John only managed to score 172,620 to Josh's 418,050 by the end of the second ball. With his third and final ball he could only increase this to 184,670 which meant Josh had won without having to play his third ball. Josh won $400 plus all the entry fees in excess of the prize payouts which brought it up to over $1000. In addition he won a PAPA registration plus two entries. John won $250 plus a PAPA registration with one entry. Andy won $200 and Trent $100. 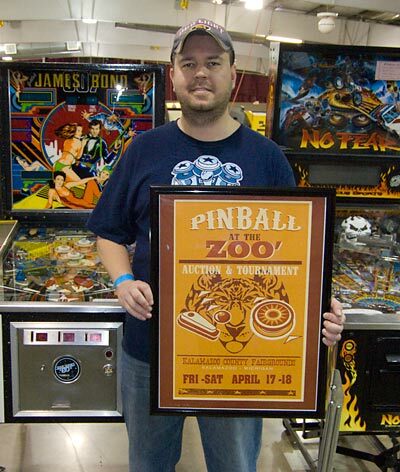 With the tournaments concluded, the 10th Pinball At The Zoo came to a close. 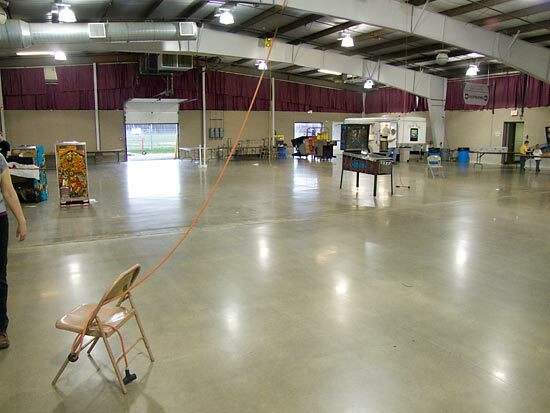 In truth, most games and stands were packed away and loaded back onto trucks and trailers some time earlier, returning the hall to near its original empty state. 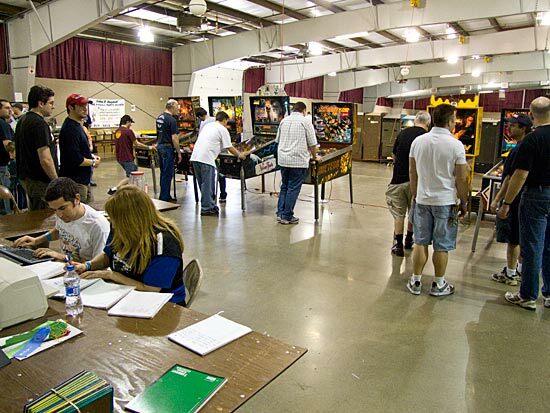 Pinball At The Zoo may not have the same number of pinballs as some of the larger events, but the show has a frendlier and more casual, laid-back feel. 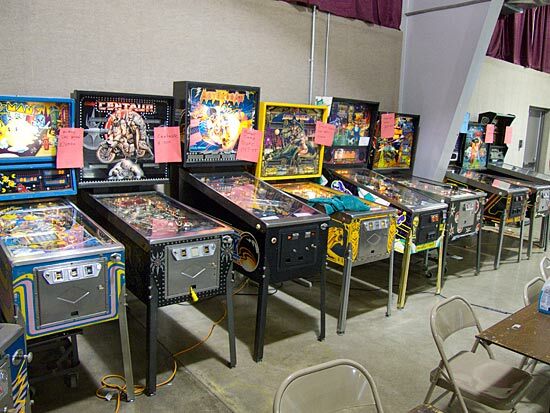 Located halfway between the pinball collecting communities around Chicago and Detroit, it's in a prime location for those fans to attend and this year proved to be the biggest show yet. 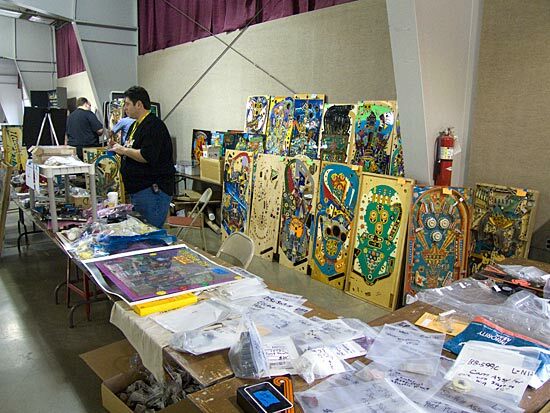 There's still the feeling though, that with increased support from collectors the show could be even bigger. The hall certainly allows for that and the vendor attendance is there too. 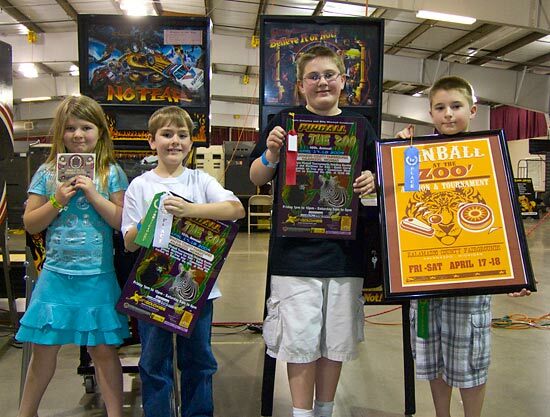 So here's hoping Pinball At The Zoo show can garner that increased support and continue its growth for its 11th year in 2010.